For starters, this is not a crude term or the name of a pub but it is something that decided a whole lot of relationships back then. The results of which decided whether you were to be friends/fall in love/get married/be a brother/become an enemy to/with someone. This might sound crazy now but it was definitely a thing then. There will always be an expert in flames and your results have to be validated with the expert. He might not be strong with abacus or vedic maths or even mathematics for that case, but he will be strong with this theory. We all had rough notes and if you get your hands on your old rough notes by some luck, don’t start from the front – go from the back and you will find these weird calculations. Like any concept, it had proven examples by taking real-life couples and reverse engineering the whole process to substantiate the results e.g Ajith and Shalini. The best part about this technique was manipulatable – first you do with the names alone and your preferred result does not come, so start again by using the full names, with the initials and a lot of other possibilities. It was like the universe’s way of telling to go for it. 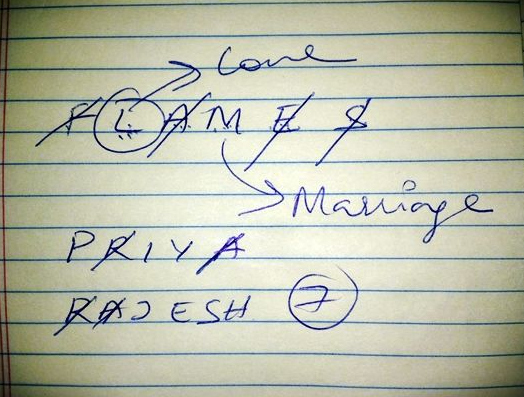 It might sound crazy about it these days but every 90’s kids will fondly remember the girl with whom he got L or M.
For the first time when i put FLAMES for me and Anil, I ended up ‘E’.